The Anti-Atlas is a desolate world of rocky outcrops and lunar landscapes where the contrasts are extreme. Most of the land is dry and barren, but water gathers and runs in some remote places, forming clear basins. Berber villages in the mountains are limited to few small houses surrounded by palm trees. For those who are seeking a real adventurous holiday that includes walking tours, rock climbing and biking tours, there are two great towns:Tafraoute and Siroua. 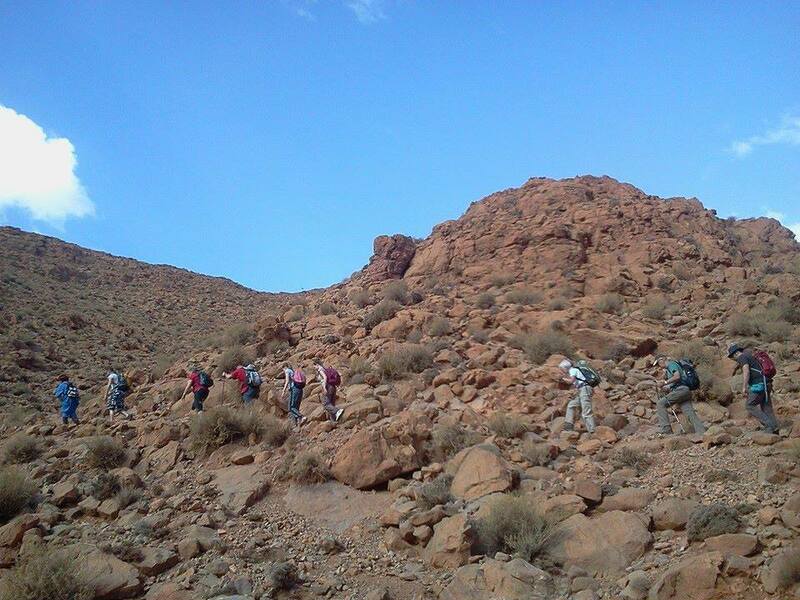 Tafraoute has the most beautiful mountain range for walking and trekking tours. It is home to many untouched natural landscapes. The early spring is the best time to visit and is the time when the region celebrates the annual almond blossom festival. Day 2: Departure for Taghzout (optional ascent to the summit at 1950 metres) and then on to the village of Mirgane. After exploring several isolated villages in this desolate terrain we pitch camp near Imi N'Taghzout (1600 metres). Day 3, 4: We will walk down to the village of Aït Iftane at the foot of Jbel Lesk, then across the massif, we'll take in a magnificent view over the Ameln and Tafraoute Valleys. Then we will walk down to Tagdichte. Day 5: We will hike against a wonderful sunlit backdrop of ancient pink granite rocks. We'll have time to explore the forests of palm trees at Tafraoute with its superb old houses. Camp will be set up near Aguerd Oudad (1000 metres). Mules or camels to carry your luggage during the days of the trek. Kitchen equipment and cook who will prepare all the meals during the trek.